Clever brands are well aware that timing on social is a core component of a well-executed social media strategy. The billions that businesses spend annually on their marketing can prove to be completely ineffective if allocated at the wrong times or in the wrong places. The challenge involves deciding which are the right times to be active on social networks and which are the platforms you should be focusing on, and that’s where social intelligence tools come in handy. By monitoring and understanding online conversations around their brands, marketers can keep track of the peaks and lulls of interactions on a daily basis, hour by hour, minute by minute, and use this data to their advantage. In our most recent industry report, “Social Insights on the Television Network Industry”, one of the areas that we explored was television networks’ online presence and the relationship between their owned and earned mentions, from a timing perspective. The rapid nature of social media means that the window of opportunity for brands to connect with a target audience is fairly small – users have become increasingly demanding and often expect a response to their questions or requests in real time. For businesses, timing social content alongside their communities’ activity and providing quick responses to social inquiries is now essential. 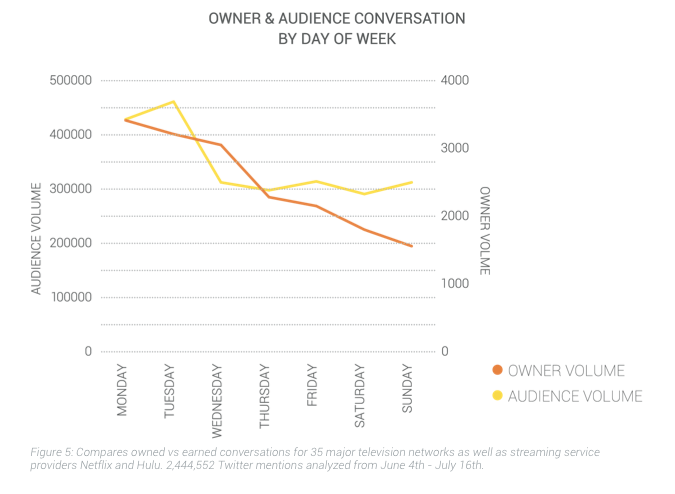 Our comparison of how the volume of television networks’ owned and earned Twitter conversations fluctuate throughout the average week revealed major discrepancies between when networks provide content and when the audience is most active in discussing television networks. The weekend, a time when TV fans seem to be chatting quite a lot about television networks, (perhaps due to the fact that they have more free time and are likely to be watching telly for longer hours), coincides with a massive drop in owned conversation volume. What does this mean? Well, by being less active on Saturdays and Sundays, television networks are likely to be missing out on opportunities, decreasing their chances to jump in and contribute to conversations initiated by the audience, that could bring them extra exposure and popularity, or make their audience feel neglected or ignored by not being able to respond to their mentions within a reasonable timeframe. Key takeaway: plan your business’ social media presence by monitoring your audience’s online behaviour and preferences. Be active at times when they need you and are most likely to engage. The hourly analysis shows that television networks are generally proficient at activating their audiences at the right moment, which is, unsurprisingly, during primetime television. But how quickly do television networks reply to audience tweets? Of the brand responses analyzed, 47% occurred under 10 minutes after the first tweet, whilst 73% of the replies were within an hour of the first mention. This stats definitely indicate that television networks are doing a fairly good job at mirroring their audience’s activity on social. While replying quickly to audiences’ comments or mentions undoubtedly plays an important role in building positive social media relationships, this is not the only factor. Clearly, a social post’s performance is influenced by much more than just timing. To explore other equally important strategies and aspects to bear in mind when aiming to build a successful social presence, download our Television Network Industry report, it’s free!